Yesterday, Crown Princess Victoria and Prince Oscar visited the Svärdsklova restaurant in Nyköping, Södermanland County for a lunch. 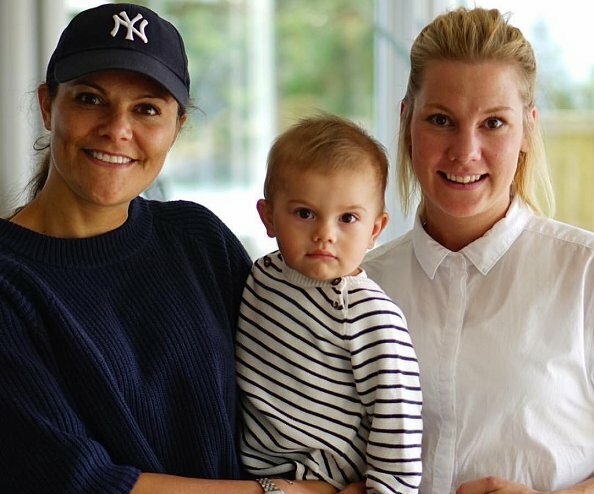 Crown Princess Victoria and Prince Oscar took a photo with restaurateur Emma Lundström after the lunch. Victoria looks relaxed, happy and beautiful! Lovely! This is why I love Victoria! She shows you don't have to be a cut-and-paste Barbie doll to be a princess! This is wonderful! I agree! You have to work hard and love people. Everything else is less important. Lassie, that's true. Victoria is a loving and caring person and that is what people sense! Cute picture. She looks lovely. Oscar is so sweet and solemn. I didn't know Victoria was a Yankees fan! ⚾️ That's a fun fact! And little Oscar is very sweet and certainly does look like his mother! Probably from her couple of years living on the east coast. Victoria looks good with her hair down. Oscar still not smiling. But doesn't his cute little serious face make you smile?